It was obviously, really. Sherlock Holmes has recently been turned into a virtually teenaged TV heart-throb and we had a ludicrous Henry VIII in the form of Jonathan Rhys-Myers, so it makes sense for Hollywood to recast the venerable Miss Marple, who solves crimes through her great experience of village life, to be played by Jennifer Garner. That’s what Disney has in store for us. One of the running gags in Christie’s novels is how an invisible old lady manages to insinuate herself into the lives of those who overlook her at their peril. Indeed, this is the unique selling point of Marple – the old are discounted, but they are in fact most dangerous. How Garner manages to cope with this will be – I was going to say interesting, but it won’t be. Paradoxically, the idea of a series of books in which an ignored old lady triumphs is now reversed, so that the old lady is once more ignored. All this shows is how the simplest and most fundamental idea is lost on Hollywood executives. I think we’ll cast Bryant & May with Zac Efron and Justin Bieber. That is absolutely disgusting. There are few enough good roles for older actors without the children taking the few there are. To say nothing of the total misreading of the stories. I guess the Christie estate must be desperate for money. How could they allow this to happen? If they wanted to make such a drastic change they could have just started from scratch! April 1 here in NZ…please, please, please tell me this is an April Fools joke. o.0 My mother adored Margaret Rutherford as Miss Marple, and I still haven’t forgiven the butchering of Agatha Christie’s works in the 80s, which saw Poirot become little more than a slapstick buffoon. It was painful to watch. On the topic of Bryant and May, young sir, when are you going to be able to tell us more about the TV gig? You’re all being dreadfully unfair to whoever that nice lady is with the tummy. For shame. I’m quite pleased with the look of the nice lady with the tummy. I’m just wondering what, if anything, she has to with the perpetually hunched old lady Miss Marple. What? NO! Miss Marple isn’t supposed engender this sort of lust in my soul for at least four more decades! Also, if we’re going to get some sort of “John & Arthur: the early days” involving the two pillocks Efron and Bieber, I shall personally travel to London solely for the purpose of kicking Admin in the shins and then return home promptly thereafter. He’ll get the message. I reserved judgement at the Disney remake until the casting of Garner was announced. Morons! I adored Margaret Rutherford, but while I liked the series run, I could never really warm to Joan Hickson in the role. Yes, she’s a lovely little old lady, but she always appeared way too sharp. I always preferred Rutherford’s doddery Marple, she made it more believable that people would take her for granted. To be fair, there are quite a lot of doddery old Marple’s out there. Truly, I understand where some people might be offended but again it’s not like this is the first time Marple’s been filmed. Previous and future efforts aren’t being rounded up and burned to make way for what might be jolly good. Or it might be bloody awful, but there’ll be writers and actors and all sorts of people employed and we don’t have to watch it. A very good friend of mine on just this subject pointed out how much we had all been aghast at Matt Smith being cast as Dr Who. Lo and behold the best (in my opinion) season since the reboot and a very effective performance indeed. Jennifer Garner is, what, thirty eight? For Hollywood, that’s positively ancient, so she must be right for the role. Gretta: With a riding crop I would always lose my Malteser. The same cannot be said for a tummy. How young do you have to be to play old people ? Is this a day early April fool then? People certainly do have different views. 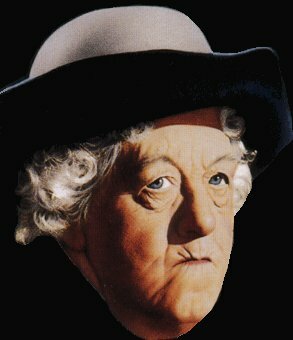 I didn’t like Margaret Rutherford as Miss Marple, mainly because no one could overlook Margaret Rutherford. There were two sets of modern ones: Joan Hickson and Julia McKenzie. I personally prefer MS Hickson, who gives the impression of years of quiet watching of the world, rather than MS McKenzie, who seems far more of the present moment. Something about MS McKenzie’s voice grated somehow, too. Why do we care so much about portrayers of fictional characters? I didn’t even care all that much for the books themselves. unfortunately my daughter would rush to go and see Bryant and May if Zac and Justin were cast.Oh the Shame! p.s. sorry about the message before, my P.C. suddenly stopped and started for no apparent reason. Gretta – I have just checked and Geraldine McEwan is who I meant, not Julia McKenzie, whom I don’t know at all, I guess. According to today’s Sun (UK, not Vancouver) MS McEwan has quit the role. She was good, but I still prefer MS Hickson’s reading. And every time I look at MS Garner I just want to puke at the thought of her playing Jane Marple. Out of curiosity, is there any chance MS Garner is related to James of that ilk? When I was younger I always wanted to be Margaret Rutherford. Of course I look more like the tummy lady so thought I’d have plenty of time left to work on the MR look before I could be ‘discovered’ and cast in the next lot of Miss Marples. My husband and I (!) like Stringer Davis too. He seemed to be the perfect foil to Miss M & the perfect husband in real life. Which twerp will they cast in that role – a really OLD MAN like Robert Downie Jnr? (drool) (sorry) Actually if anyone is interested I’d make a v.good Miss Silver. Frankly, I like Margaret Rutherford as Miss Marple. I’m quite aware she’s a betrayal of the actual Christie character (not to mention plots: she brazenly appropriates Hercule Poirot stories, shameless hussy that she is! ), and, to the overlooked sleuth strategy, she usually prefers the berserk Sherman tank approach. But it’s fun. But then again, when The 3 Musketeers see them fighting ninjas in Venice, the concept of Hollywood being true to the original material has pretty much been mauled, shredded and exploded to atoms, anyway. Wasn’t there a non-Christie novel in which a young Marple is inspired by an old Holmes? Really? I think I’d like to read that. Have you noticed that mystery fiction characters can be taken over by other authors without too many complaints? Or is it just Holmes? How tight a grip does the Christie estate have on the character? I doubt Alistair Sim had such flat abs, but he would have been equally brilliant as Bryant, May or Miss Marple. Can Quantity Still Have Quality?